Do you think it is possible to make a batch of cabbage kimchi within 30 minutes from start to finish? Around this time of the year, I often have a craving of freshly made kimchi. After the winter season of having many dishes made with deeply fermented kimchi, I feel like it is about the time to embrace the spring cabbage and make a batch of fresh kimchi. Yes, it is possible to make kimchi within 30 minutes all from scratch. I will call it 30 Minute Kimchi. 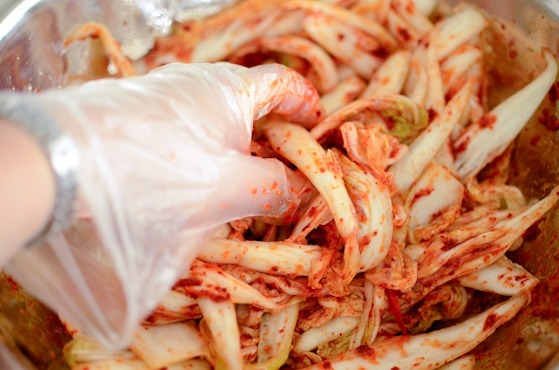 Authentic traditional cabbage kimchi takes 2 days to make. 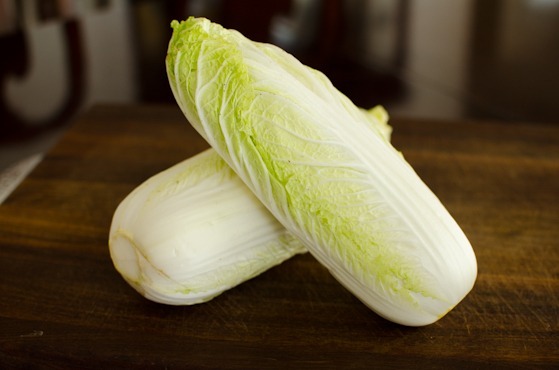 More simplified version of easy cabbage kimchi takes about 3 hours. Then how can this labor intense kimchi making be done in 30 minutes? Koreans call this particular type of kimchi, “Gutjeori (겉절이)”, which translates into briefly salted kimchi. 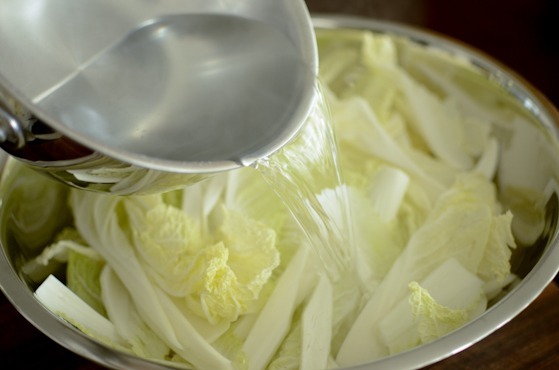 However, even the traditional Gutjeori kimchi itself takes at least 1 hour alone to soak the cabbage in salt. But today I am going to share with you a unique way to speed up the soaking process. Here are some cabbages. Koreans like to use young napa cabbages for this recipe which yield tenderer and sweeter flavor. They are more yellowish than full grown napa cabbage. I am using local cabbages here and they seem to be more elongated than Korean origin. Cut off the stem part of the cabbage. I like to cut the cabbage leaves vertically this time. For smaller leaves, cut in half. For bigger leaves, cut into 2-4 sections. Now, The important part! 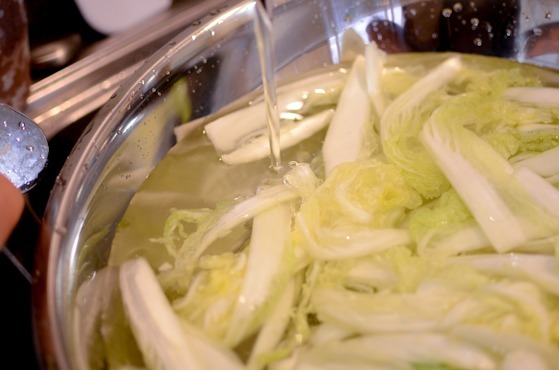 let’s soak this cabbages in express salt brine. 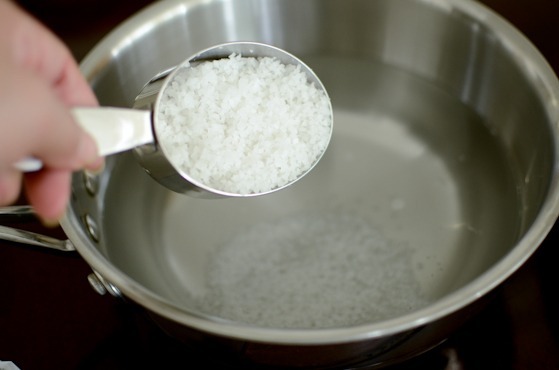 Mix 1/2 cup of Korean sea salt with 5 cups of water. Bring it to a full boil, stir to dissolve all the salt. Let it cool down just a little, about 5 minutes. Pour the hot salt brine over the cabbages and stir well. Using a hot brine will help salt to penetrate into the cabbages faster to withdraw their moisture. It won’t cook the cabbages but creates crispier texture. Let it sit for 10 minutes! Turn the cabbages over and let it soak 5 more minutes. That’s it! And you will see the stem part of cabbage will bend without breaking. Rinse once and drain thoroughly. Meanwhile let’s work on the kimchi filling. Combine garlic, ginger, diced onion in a blender. Add anchovy sauce and puree all together until very smooth. 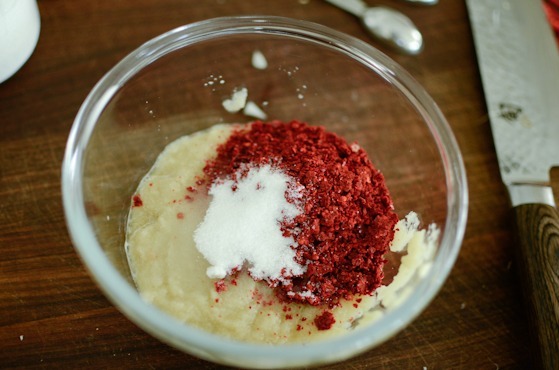 Pour the onion puree in a small mixing bowl and add Korean chili flakes and sugar. This is plum extract for tea which is my secret ingredient in many Korean dishes, and it is home-made. You provably will have a hard time finding it outside of Korea. Therefore, disregard this ingredient. You can omit it and your kimchi will still taste good. But if you MUST use something to make-up for the missing ingredient, use 2 tablespoon of sweet apple juice + 1 teaspoon of honey instead. Mix all together very well. Toss well with your hand. Make sure you wear a protective glove for your delicate hand. 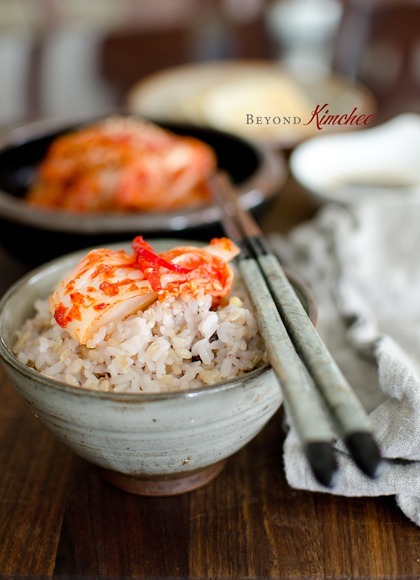 It is a good idea to sprinkle lots of toasted sesame seeds for this type of kimchi. Toss again. Take a piece and taste. You can add a little more salt or anchovy sauce if needed. Mine was just perfect the way it was. Store this kimchi in the fridge all the time. I want to mention that this type of Gutjeori kimchi is meant to be consumed soon, within 10 days if possible. They will go ferment after that but they are not ideal for a long term fermentation. I do LOVE freshly made kimchi over freshly cooked rice. It just reminds me home of my childhood. 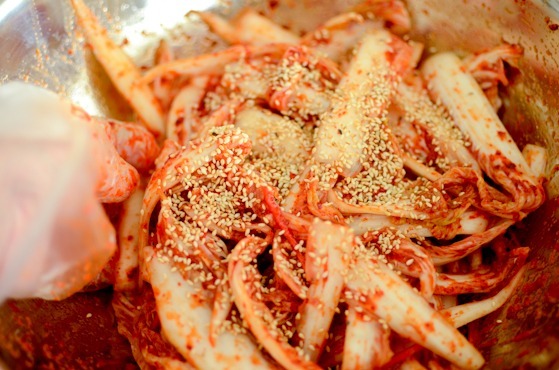 But this type of kimchi shines the best when serve with Korean wheat noodle soup called Kalguksoo. Such a comforting combination for me. Well, do you think you can make this kimchi within 30 minutes or so? Would you give it a try? If you do, I would love to hear from you how it turns out. Kimchi making is fun. Enjoying your labor of love is rewarding. Hope you enjoy this kimchi as much as I did. 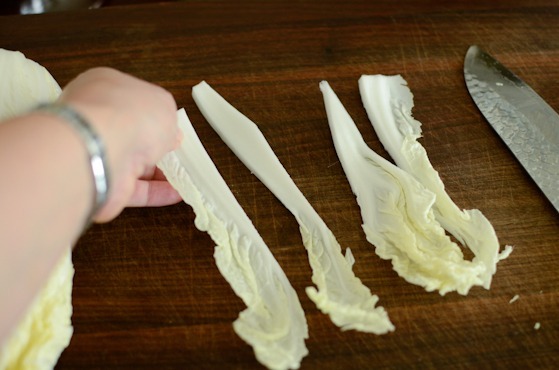 Cut off the stem part of cabbage. 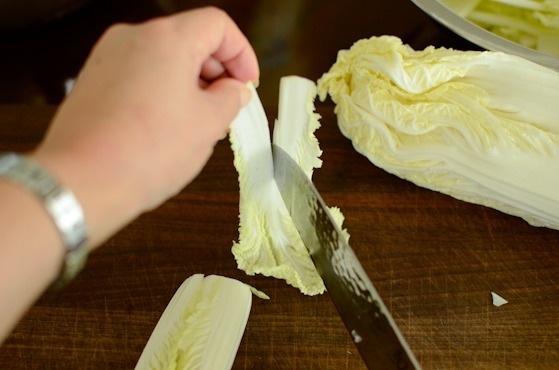 Cut each cabbage leaf in half or 3-4 section (depends on the size) vertically. Place the cabbage leaves in a large mixing bowl. 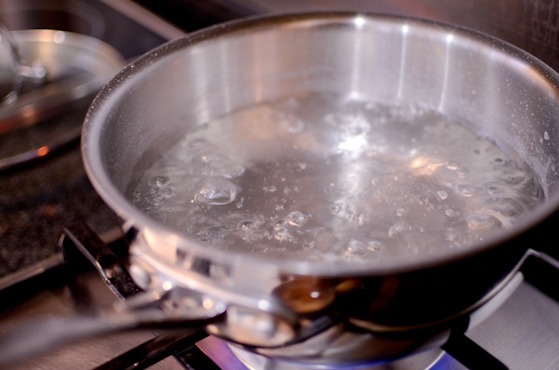 Combine salt and water and bring to a full boil dissolving the salt. Cool down for 5 minutes and pour over cabbages in mixing bowl. Let it sit for 10 minutes, turn the cabbages over to the other side and continue to soak for 5 more minutes. Rinse once and drain thoroughly. 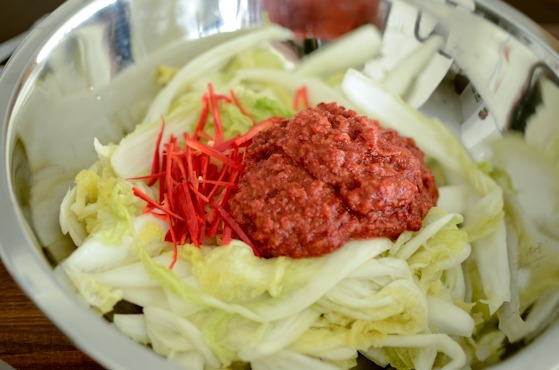 To make kimchi filling, combine garlic, ginger, onion and anchovy sauce in a blender and puree until smooth. 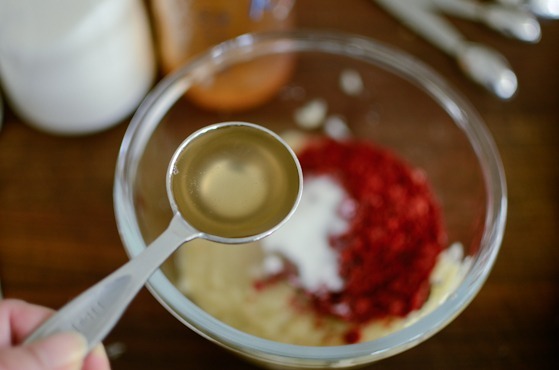 Pour the puree in a small mixing bowl. Add Korean chili flakes, sugar, and Koran plum extract for tea, if using. Mix well. Place drained cabbages in a large shallow mixing bowl. Add the red chilies if using, and the kimchi filling. Toss all together to coat evenly. Sprinkle toasted sesame seeds and toss well. Adjust seasoning as you wish. This kimchi will stay fresh in the fridge for 10 days. Not ideal for a long term fermentation. I love any Korean recipe that starts with "30 Minutes..."! Can't wait to try this kimchi variation. Thanks for sharing! I will try this kimchi recipe. I've never made it myself yet and this sounds easy to make. actually have a small, young napa cabbage in my fridge for this very reason. craving the sweet, crunchy spicy! going to give your recipe a try. thanks! This is a terrific recipe! 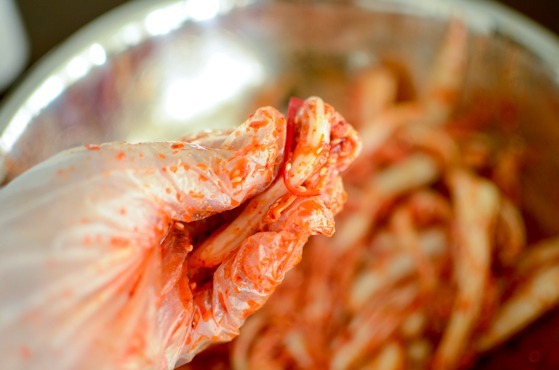 With such a short preparation time, there's no excuse not to make Kimchi. It doesn't get any easier than this. Thanks so much - this is terrific. Wow, you make plum extract at home?! How do you source the plum? I would love to make it myself too. I think the 15 mins brine trick is really cool. I should try this method this weekend when I making more Kimchi! Thanks for the tip. I'm really happy to have found this technique. It's much faster than the method I usually use. In fact I just made some on the weekend and had some chilli paste leftover, so I'm trying out this method. I'll be able to compare kimchi made by both methods. This cuts sooooooo much time off the process. The recipe I usually follow uses half of a pear for sweetness. Great! I hope it turns out good. Thanks. Holly can I use Kosher salt instead of Korean salt? And is anchovy sauce the same as fish sauce or anchovy paste? Thanks can't wait to make it. You can use kosher salt. But reduce the amount a little. I would use about 1/4-1/3 cup instead of 1/2 cup. This sounds great! I've been wanting to try making kimchi for a long time, but it's always seemed like such a production that I never have. Thanks for making such a simple, approachable recipe! I can't wait to try it. Fast and looks delicious! I can tell the flavor doesn't look like just 30 minute cooking. Great recipe, Holly! I was just telling my boyfriend that I wanted to learn how to make kimchi since I found out that the store brand I buy has MSG. I'm still scared to death to make the mega-super traditional kimchi. 30 minute kimchi sounds more my style. I love deeply fermented kimchi, but fresh one is always welcome...I could eat few cups by the time or before I put it in the containers hahaha...I love your 30 min recipe! I can't wait to try it. Have a wonderful the rest of the week, Holly! I wish that you made videos on youtube. Just made this, and it turned out really well. The taste is just right, even though I didn't have any plum extract and therefore had to use my own “secret ingredient“ ;-) I think I should have let the cabbage soak in the brine a little longer, as it was still quite crunchy... tastes good, though. 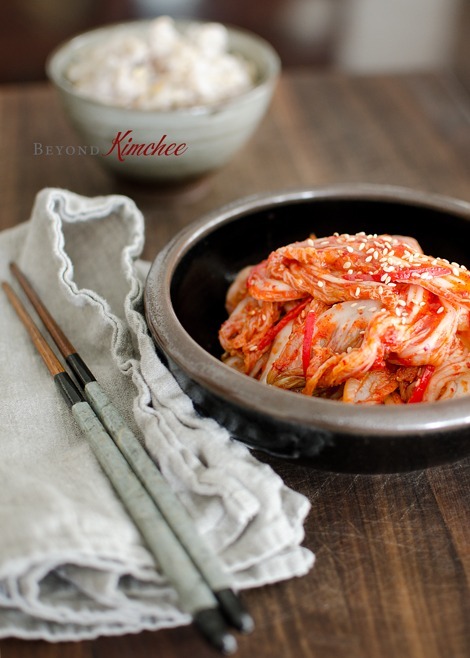 A great way to make quick, tasty kimchi! And finally a reason to buy plum extract at my admittedly rather well stocked korean grocery. Ta so much for this recipe, it worked out really well, even though it was my first time making kimchi myself! That's great to hear Sakura! I am glad your very first batch of kimchi was successful. I think soaking time might vary depends on the cabbage you use. If you can find plum extract, go for it. It has so much use in Korean cooking. hi there. can you tell me what the packaging for korean sea salt looks like? i only have regular sea salt, but will be going to the korean market this week so i'd like to get the korean one . thank you! Hi Patty You will find the picture of the Korean coarse sea salt package in this post. http://www.beyondkimchee.com/cabbage-kimchi-or-kimchee-part-1/ You might not be able to find the exact same brand since there are many, but any Korean coarse sea salt will work. Ask the shop owner for the "chun-il-yum" salt for kimch making. He/She will help you find what you are looking for. Hi Holly: Looks delicious! I'm vegan - do you have a substitute for the anchovy sauce? You can omit the fish sauce. Although the fish sauce will bring the potent flavor in kimchi, you can still make the delicious kimchi without it. Just made this - WOW, it tastes amazing! Maybe a little too salty as i think i soaked it for too long, but the flavour is to die for! Will make this again and again! Hi Holly! 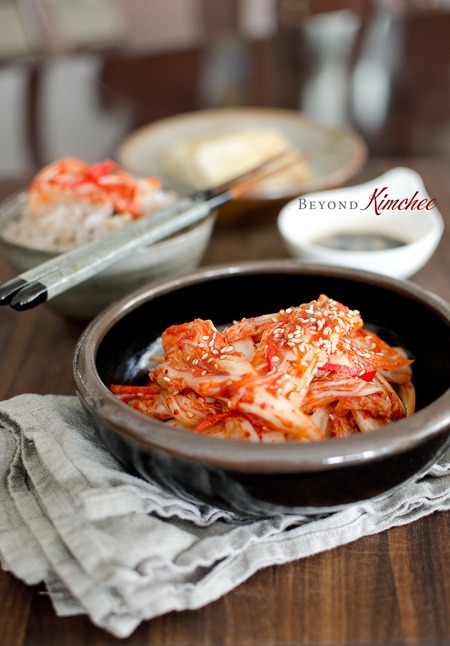 I have recently become aware of all the health benefits of Kim Chee and started making it at home, with the help of your wonderful blog! =) I do have a question though: on the Kim Chee post which is divided in three parts you say that the cabbage preparation is the key to successful Kim Chee and that soaking it the way you taught (leaving it overnight with salt) will make it the kind of Kim Chee that lasts for months (at least that's what I understood). 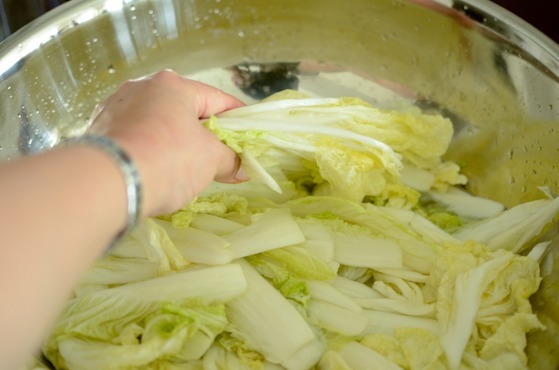 So, ultimately, if I soak the cabbage like that, but proceed with the rest of the Kim Chee preparation in a faster way as described in this post, will it be this long-lasting kind of Kim Chee? Or would I still have to eat it quickly? I would love to hear your thoughts on that! Thank you very much and a hug from Brazil! Oh yes, a small PS - I'm using French coarse sea salt from Guerande since I can't find Korean sea salt. Is that ok? Many thanks again! I think it should be okay. Good luck! Hi Marilla Sorry for the late reply. You can use the quick version kimchi filing to the cabbages soaked in traditional method and store for longer fermentation. 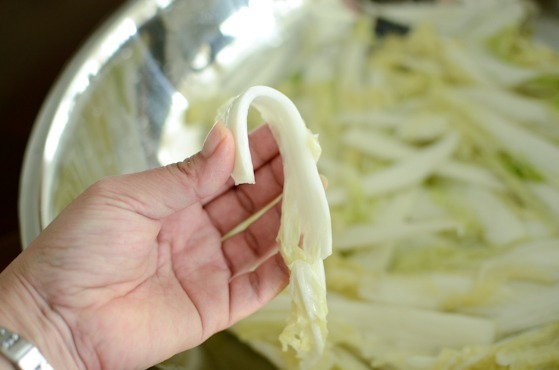 However traditionally, we like to add a form of rice glue to help bind the filling to cabbages which will bring better fermentation if you intend to store kimchi longer period. Also adding extra favors in the filling brings layers of flavor as they ferment together. Thank you for this recipe, Holly! I just made some and it cured my Kimchi craving. I will make this often. Thank you for this recipe. I love kimchi but my tolerance for spicy food/dish is very low to zero. How do i make it less spicy? Or it is possible to make a non spicy kimchee? You can use less chili flakes to meet your need. There is a kind of kimchi that doesn't use any chili. I will think of posting it someday. Thank you so much for sharing this recipe. 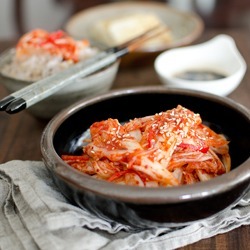 I have been trying to make good kimchi for the last 17 years (since I got married to my Korean husband) and this one is by far the best, easiest and most reliable recipe I have come across. All kimchi-eaters in our family simply love it. Hi Shaz, as long as the Thai chili is not the kind that are extremely hot, you can use it. I personally recommend to look for finger long red chilies that are common in Asia. You can use fresh chilies instead of dried kind. Just process the fresh chilies until you get the finely chopped consistency. You can adjust amount depends on how much redness or spiciness you desire. Holly, your recipes never fail. I've tried this 30 minute kimchi and I love it even though I'm a huge fan of old, sour and well fermented kimchi :-) Thank you! Will share this one with my readers. That is so great. Hope your readers will like it, too. Hi Holly, I am a complete dummy in the kitchen but took the plunge to try this "express" kimchi recipe… well it didn't turn out too well i'm afraid :( First of all not all the cabbage stems bended, although I left them in the brine for a longer time. The second problem was adding too much ginger I believe. Sorry but how big a piece of ginger did you use? My 10 yr old daughter, who is a big kimchi fan, was hugely disappointed. She said the ginger taste is too strong. So how do I counteract the strong ginger taste? The kimchi also tasted crunchy instead of limpy. Is sand eel sauce the same as anchovy sauce? I used sand eel sauce since that was what the lady at the mart gave me when i asked for anchovy sauce. I hope to hear back from you, so I can have the courage to try other recipes from you. Thanks! Ling, ginger is essential ingredient in kimchi, but too much of it will overpower the taste and makes it even bitter. The good guide for the amount of ginger in kimchi recipe would be about 1/3-1/2 volume amount of garlic. Fresh kimchi is usually slightly crunch. It gets lumpy as fermenting. Also I am not so sure what the sand eel sauce is, but it doesn't sound right one to use in kimchi. I am sorry to hear that your kimchi didn't turn out well. But keep trying. You will eventually get it right. Cheers! Hi Holly, thanks for getting back. The kimchi tasted much better today :) But yes, I shall take note of what you said. And btw, you'd be pleased to know I attempted the "braised pork ribs and kimchi" recipe today for a pot luck dinner, and boy was it good! Thanks to you, I garnered a lot of praise! For a complete novice like me, it was very encouraging indeed. Thanks again for your excellent blog - very reader friendly, the step by step explanation is great, and not to mention the enticing shots of the food… I can't wait to try the other recipes! I'm taking baby steps in my kimchi evolution! Just made this quick version and can't wait to experiment with the real deal fermentation! Thank you!! I used to visit a little restaurant that had the greatest kimchi, but I don't live in that area anymore and really don't like store bought. It only took one phone call to find the ingredients at a nearby Asian Grocery that I cannot buy in most grocery stores, including the Koran Plum Extract for Tea. I am looking forward to trying this. That is so great, Brad! Glad to hear that you were able to find the plum extract. Have fun making kimchi and all the culinary adventures in your kitchen! Hi, I wanted to update my post, I purchased what I could at the Asian market and made the kimchi, minus the extra chilis and toasted sesame seeds. It tasted better than the kimchi that the market makes. My wife suggested putting in some toasted sesame seed oil, and that gave it a fuller, better taste. I am guessing once it sits in the fridge overnight, it will even be better. I don't think the plum extract was exactly right, it is Gung Jung Plum Juice, but it worked. Thank you for a great recipe. Tried your 30 min Kimchi recipe and it was yummy! Thanks for sharing! By the way, great recipes. I made some about 15/16days ago. Do you think it is still good? Yes, it should be alright for another week or two. I will try to make this soon -looks so good. Regular soy sauce won't bring the right flavor of kimchi. If you want to avoid anchovy sauce, try with Thai fish sauce. That will work fine. 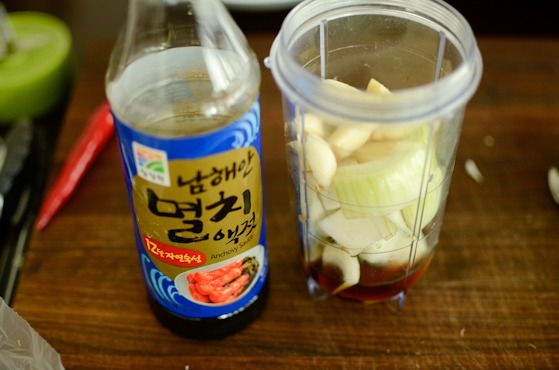 If you want to avoid any type of fish sauce, then you can use a sauce called "Korean soy sauce for soup (gookganjang)". It is similar to fish sauce but made with fermented soy and more pungent than regular soy sauce. Hope this helps. Can't wait to try this recipe! I'm far from a store that carries gochujaru, but I have gochujang! Will that work? 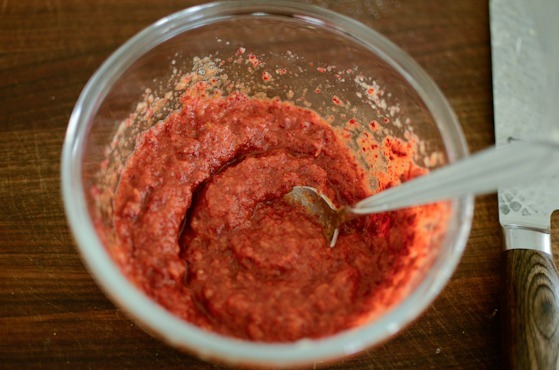 No, gochujang is not the same as chili flakes and it won't work on kimchi recipe. 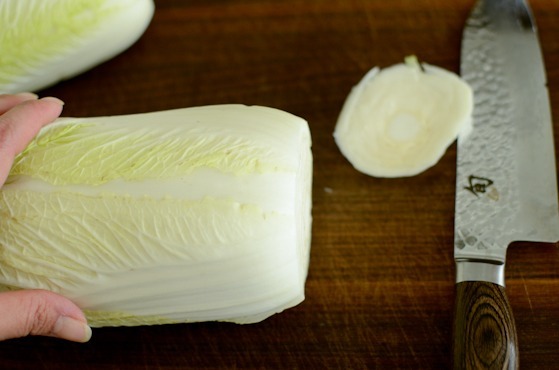 Could you use radish (daikon) instead of cabbage for this 30 minute recipe?